HUGH HEWITT: Morning glory, America. It's Hugh Hewitt on this March 9th 2018. And what a day to talk to Dr. Larry Arnn, President of Hillsdale College. It is The Hillsdale Dialogue. Each week at this time, I talk with Dr. Arnn or one of his colleagues about an important matter from history or the front pages. We're going to do both today because the summit between Donald Trump and Kim Jong-un, announced yesterday, put squarely in front of us a record that Dr. Arnn is perhaps better prepared than anyone else to talk about. It's the record of summitry in World War II, whether it was the Moscow Conference, the Atlantic Conference, the Second Moscow Conference, the Casa Blanca Conference, the Bermuda Conference, the Quebec Conference, the Tehran Conference, the Third Moscow Conference, the Dumbarton Oaks Conference, Malta, Yalta, the Fourth Moscow Conference, or even Potsdam. Larry Arnn, can you summarize all those for us right away? LARRY ARNN: Good lord, you looked them all up, didn't you? We're doing volume 21 of the document volumes of the Churchill biography. And I'm editing it right now. And I'm in the section on Yalta and all that's going on right now. And Yalta-- so the word summit was invented during these times for these meetings. Churchill believed in them very much. He thought that the hope was that Stalin would be senior enough and smart enough to realize that it would be a better world if the East and the West got along. And Churchill was prepared to offer Stalin-- did offer him and tried to enforce it-- that the West would help guarantee that the border states around the Soviet Union, including especially Poland, with which Britain had special relations, would be friendly to the Soviet Union. They should be independent and free, but they will be friendly. And at Yalta, Yalta was the happiest of all of the big three meetings, where all of them, Roosevelt, Churchill, and Stalin, were. But within weeks of it being over, I mean, within a month of it being over, Poles from the West, the ones who'd immigrated and escaped and formed a government in London, had gone back and they were being arrested and liquidated. So they don't always work, but Winston Churchill believed in them. HUGH HEWITT: Now, we should, before we go a step further, celebrate for a moment Gary Oldman, your friend, winning the Oscar for playing Churchill in this pivotal moment, The Darkest Hour. And I hope you're as happy as I was. Did you watch it live? LARRY ARNN: Oh, well, I can't bear that thing. So I watched it on YouTube. But I watched the news going on to make sure I knew when he won. Then I went and watched the thing the minute it was posted on YouTube. And he's a good guy, right? He's, in important ways, a regular guy. And he's become more famous now than ever. And I don't think that will have much effect on him, because what'd he do? His speech was simple, grateful, and just a little bit proud. And that's the way a disciplined, well-ordered human being would react. And so many of them react that way. And his speech, at all three times he won-- what did he win? He won the Golden Globes. And he won the Screen Actors Guild. And he won the Academy Award. And all three times his remarks were eloquent because they were simple and because they understood what you're supposed to say in such a setting. HUGH HEWITT: He also thanked Churchill at the Academy Awards, which I liked because that's, in essence, thank you for saving the West so we can make movies. LARRY ARNN: Yeah. And he, in the course of this-- you called him my friend. And I don't know if he is that. But I know him pretty well, and I admire him very much. But I do know that in the course of doing this, he, like anybody who reads Churchill with open eyes, marveled at him because-- I probably said this before, but it happened again last night. I was reading something about Winston Churchill last night to get ready for this show. And I just, after all these years, I'll get carried away, and I'll say, Winston Churchill-- to myself-- Winston Churchill was a very great man. And my wife will say, you have said that, dear. HUGH HEWITT: Well, last night, to get ready for tonight, I took the stage in front of an audience of 200 people at the California Club to interview Edwin Meese in front of the Friends of Ronald Reagan dinner. And of course talk turned to Reykjavik. And it turned to the fact that what was thought to be a failed summit was, in fact, a victory, because Ronald Reagan knew his own mind. He went prepared. There's a very famous photo of Reagan and Schultz leaving grim-faced and how the world wrung their hands, and then the Soviet Union was no more three years later. Or actually the Berlin Wall came down three years later. And the Soviet Union dissolved a couple of years thereafter. But in fact, when these summits happen, we don't really know whether they're good or bad for a long time, Dr. Arnn. LARRY ARNN: Yeah, that can be true. And this one-- I really look forward to this one. I think, among other things, it'll be great theater because Trump is really great theater. But this one is ridiculous in a way because North Korea is a pitiful little place and a blemish politically on the face of the Earth. And we're a great nation and free. So it's ridiculous for us to be talking. And you'd think that there would be only downside for Trump. And that's conventional thinking. Isn't it true that in dealing with this festering sore of North Korean nuclear weapons, that presidents have been careful to keep their distance from it, right? The things that come out, the agreements that are made are complex. And as you point out about this, you don't know for years whether they mean anything or not. And then you find out that they don't. And that's happened over and over again. Well, Trump's sticking himself right in the middle of it. And there's risk to him from this. Now, having said that, here's how I-- Trump is a very candid man. And so I don't think that we're going to get the usual eyewash, the carefully couched statements. I think that he might just really say-- if he gets on with them-- here's how he gets rolled. If he gets on with the guy and he makes those comments like Bush made, that George W. Bush made about Putin-- I can see that I can trust him. And then he makes some agreement and it's made out of tissue paper and it doesn't hold, then Trump will look ridiculous. And Trump has styled himself a tough negotiator who's going to make good deals. Well, I don't think he's going to do that. I think he's going to end up finding a way to be strong in this. HUGH HEWITT: I think my phrase that I've used this morning a few times with Chuck Todd and Margaret Brennan is a reverse Munich, where Trump says, my way or no highways for you. Meaning it's just the end of it. And I quoted from Richard Nixon's 1980 book, The Real War, when RN wrote, "a president should go to a summit only if the stakes are worth the risks and if the meeting is thoroughly programmed in advance. No American president should go to a summit with an adversary, unless he knows what is on the other side of the mountain." If Trump knows that he's going to go there for the purposes of doing a reverse Munich, which is, this is what we're going to do, or we're not going to do anything, and you're getting nothing else from us, no more food, no more shipments, no more coal. You do this, and you can work it out later with Bolton over here or McMaster over there. But this is the bottom line. I'm not the guys who came before. It will be a success. If he goes there for the photo op and the change the page, it won't be, Dr. Arnn. LARRY ARNN: I think that's right. And see, like the Iran stuff, right, they're a bunch of liars and tyrants, these people who rule Iran. And so we go over there and make these deals with them about an inspection. And then you always read a month later that the people for the UN doing the inspections don't really even care or believe in the process. And so it's-- it can't be like that, right? He's got to ask for something clear. And then I think he's got to take a range of bad things he might do to them. And some of them might be violent things. And he's got to be ready to do them. HUGH HEWITT: And be clear about that. Now, the greatest achievement of W's eight years that nobody talks about is he got Gaddafi to give up everything. And that took a year to actually get in there and grab everything and get it out of there. It took one massive convoy to get the most dangerous stuff, but it took a long time. You can't do that in two months. I am curious if you think he's got the team to pull this off, Larry Arnn. And I'm volunteering you to be part of that team, I think, if the president's listening right now. Because you know all about these Churchill summits, and he's talking learner. There's a lot. And we'll come back, and we're going to talk about these Churchill summits. There's a way to do these things, and there's a way not to do them. And the way not to do them is Bill Clinton at Y River with Ehud Barak and Yasser Arafat, where you just talk, talk, talk, talk. And in the end, you don't make him do anything because Arafat says, screw you, guys, even though they gave him the world. LARRY ARNN: That's right. That's right. Well, Churchill was a very formidable human being. And about these summits, there's probably 500 pages of correspondence directly to and from Churchill about the Yalta Conference. HUGH HEWITT: Oh, my gosh. LARRY ARNN: And he's talking to people night and day, right? Messages are going back to London to the war cabinet, and Eden is there. And so he's talking to a lot of people. But then it comes down to long conversation with Franklin Roosevelt and Joe Stalin. HUGH HEWITT: We come back from break, we're going to talk about that. They did that, what, three times, Dr. Arnn? Three times they sat down. And we're going to talking about each of those because the one guy you want to have on the radio at a time when a big summit is announced is Dr. Larry Arnn, who knows these things. Everything Hillsdale is collected at hillsdale.edu. He's going to actually throw together a course on summitry tonight and put it up there. That's not true. But maybe he'll do that. I'll be right back with Dr. Larry Arnn. Stay tuned. Welcome back, America. It's Hugh Hewitt with Dr. Larry Arnn, the President of Hillsdale College, in our weekly Hillsdale Dialogue. All of the Hillsdale Dialogues, dating back to 2013, are collected for your podcast binge listening at hughforhillsdale.com. And all things Hillsdale, including a wonderful course on Winston Churchill and an amazing set of courses on the Constitution, all for free are available at hillsdale.edu, as is your ability to sign up for free for Imprimis, which will arrive in your mail and just illumine and educate you every single month. Go to hillsdale.edu and do that. Dr. Arnn, I want to cover in this segment Churchill summiting with FDR, because they really were summiting. They were Allied summits. And then we'll go to the summits with Stalin next segment. But how did he establish, and why did he want to make it so personal with FDR? LARRY ARNN: Well, start with this, how does a collectivity make a decision? You, Hugh Hewitt, I, Larry Arnn, can make a decision. Shall we go over here or over there, right? But how does a collectivity make a decision? And if it's a nation, it's a constitutional decision, right? And if it's any other kind of collect-- there has to be something like that. So the point is somehow you've got to come to a place where you make a decision. Well, if you just read the documents around all these summits, including Churchill and FDR, there's an enormous number of people who are being consulted under processes of constitutional rule. But then all of that comes to a point when the two people sit down together. And that means that if Anthony Eden and Molotov or Anthony Eden and Cordell Hull, American Secretary of State, have a meeting-- Eden was the British Foreign Minister-- then they've got to refer back all the time, right? LARRY ARNN: But these two guys are sitting there now, right? So Churchill saw that that is expeditious, that two executives able to speak for the nation sit down and talk. And the back and forth, you see, that's what a conversation is. You say something. I say something back. If you're going to reach an agreement, that's how you're going to do it. Well, Churchill says that he wooed Roosevelt harder than any man ever wooed a maid. So it was a courtship, right? And the reason was if you just-- Churchill had a strategic sense. And if you've got one, you can see the point. In 1940-- well, all of this really started happening in December of 1941 when Japan attacked the United States, and then Germany, in a fit of idiocy, declared war on the United States. So now we're allies, right? And he'd been wooing Roosevelt with good effect until then. But he hadn't been able to get him in the war. But if you just look at the numbers involved, then Germany, for a long time, allied with the Soviet Union against Britain alone. That's just overwhelming. That's just hundreds against tens, right? And so he just looks about the world and says, from whence does my help cometh? And he knew in a heartbeat and instantly. But he'd known it for all of his life. And he was 65 years old at this time. The United States is the great repository of force for good. So he had to go and court and marry the President of the United States. And that's what he did. HUGH HEWITT: And he began it with letters. And he charmed him. And when they would meet, was there an agenda? Was it structured? Or did he have an arc that he wished to travel over at a pace, whatever was comfortable with FDR? LARRY ARNN: The answer is it was both, right? Because those two guys, you're going to script them? They script themselves. A happy period in their relations is from 1940 until 1943. And then problems really dominated their correspondence, although it was always warm. And Churchill was very eager to keep it warm and felt the warmth and Roosevelt, I think, too. But British and American interests diverged, as they saw them, in 1943. And that was the trouble. The end the end of the Second World War is sad for Churchill. We're doing the document finds toward the end of the war now. And he loses an election at the end, right? And his country became a little country. That was the cost of the glory that's in Darkest Hour. So Churchill, he tries to keep that flame alive with Roosevelt and largely does. HUGH HEWITT: When we come back, we talk about when Roosevelt and Churchill went off to see Uncle Joe. There's a new movie coming up, by the way, with Steve Buscemi called The Death of Stalin, and which promises to be the funniest movie of the year. But the very serious summitry of Churchill, FDR, and Stalin next with Dr. Larry Arnn, as the Hillsdale Dialogue continues. Welcome back, America. It's Hugh Hewitt on the day after the stunning announcement that Donald Trump will meet with Kim Jong-un at a time and place to be determined, hopefully in a neutral site, like Reykjavik. But I suspect it will be Beijing. I hope that Donald does not go to Pyongyang. And I can't imagine Kim Jong-un coming to the South. But we'll see. We will see. I have Dr. Larry Arnn, the President of Hillsdale College, in our weekly conversation. And it could never be more timely because summitry is Churchill, and Churchill is summitry. And there are three, in particular, four, Tehran, Moscow, Yalta, and Potsdam that I'd like you to walk us through, Dr. Arnn. Because if there's someone who mastered the summit or at least knew what he wanted to get done, even if he couldn't always get it done, it's Winston Churchill. LARRY ARNN: Yeah. So I can encapsulate them for you. In one way, the second of them is the most important, although Roosevelt wasn't there. So Tehran Conference in Tehran in Iran was the first one. And in all of the ones where Stalin appeared, they had to go to Stalin. They couldn't get him to go anywhere. And Roosevelt was getting old and sick by the end of the war, so it was a heck of a thing to get to Yalta in the Crimea, by the way, which is part of the battle over Putin's policies today. So they went to Tehran. And in a way, that's the worst of them. Because the first thing that happened at a dinner was that Roosevelt engaged Stalin in ridicule and humor at the expense of the British empire. And so Churchill had been courting him for so long. And then this happened, right? And so he's got this murderer on a mass scale together with the President of the United States ridiculing the British empire, which, I remind listeners, about 43% of the British war effort and more than that in casualties in both World Wars came from imperial nations, all of whom were volunteers. Parliament in London had the power to conscript or compel no one from those people. They all went because they wanted to go-- halfway around the world, right? So it's a tremendous story. But Roosevelt thought that it was a problem. And so Churchill was heartsick about that. And then they get engaged in a banter around the table about how many tens of thousands of German officers to shoot as soon as they rounded them up. Churchill left the table over that. Stalin followed him with a translator and slapped him on the back and said that they were just funning. Churchill was sick on the way home. I mean, ill, physically ill.
LARRY ARNN: Almost unto death, right? So that's the first one. The second one, Churchill went to Moscow in October of 1944. So the D-day is in June of '44 and the war ends in Europe in May of '45, so about midway between. And the United States has compelled on Britain a decision to make their second invasion of Western Europe through Marseille in the Mediterranean, which is in the Western Mediterranean, that is to say a long way from Eastern Europe, which the Red Army is gobbling up. LARRY ARNN: And Churchill fights about that, and he writes to Roosevelt, this is the first cardinal strategic mistake that we have made in the war. We should have gone farther east. He didn't get any satisfaction. So he flies to Moscow. And there's this tremendous conversation there, just Churchill and Stalin and the interpreters and note-takers, of course. And so it's all very confidential and, of course, all very public at the same time, which these summits are. And Churchill slides a note across the table to Stalin. Stalin says, Averell Harriman, the great delegate or legatee of Roosevelt, is in town. And he says, he's here. Should we have him? And Churchill says, many of our conversations, but you and I need to just talk. So he's excluding the Americans, right? And he moves this document across. And there's an image of it on my computer right now. In Churchill's handwriting it says, Romania, Russia 90%, all others-- that means Britain, the United States-- 10%. It says, Greece, Britain with the USA 90%, Russia 10%. It's the famous percentages deal. And in this deal, Churchill said, these countries that the Red Army has taken up, you have 90% control of them until free elections after the war, and we get the same in Greece. Now, Greece is important, along with Turkey, which Churchill also did very many things to secure. They became the southeastern flank of NATO. And Churchill is trying to save them. And they're the only places in Eastern Europe to which the British can get by themselves. And so Churchill goes and makes this deal. And it's an interesting thing. He and Stalin largely respect this deal right through to the end of the war, when the Red Army starts working its cruelties and despotism on the lands conquered by the Red Army. Churchill kicks and protests, and so does Roosevelt, like crazy about Poland. 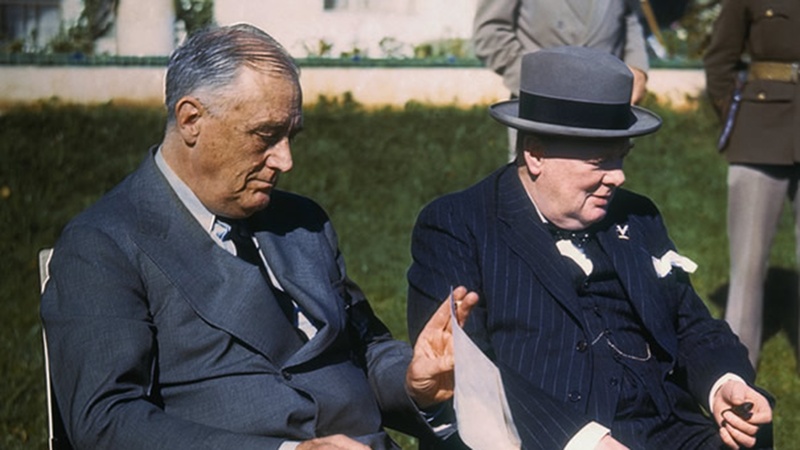 But when Roosevelt says, what about Romania and Bulgaria, the two where Russia got 90%, Churchill said, well, they're respecting the deal in regard to Greece, and we need it. A British army arrived. 5,000 people arrived in Athens as the communist-partisan army, fueled by the Soviet Union, the Greek Communists, were within two blocks of the capitol. LARRY ARNN: And so he-- they went and rescued Greece, right, and later Turkey same way. Well, he wooed Turkey diplomatically onto the Allied side. Churchill was a great courter, lover, in these things. So that's very consequential. And that was a bold stroke by Churchill that helped rescue one part of the southeastern Europe, two parts. And he was angling for that hard. And so that happened, right? Then the Yalta Conference was the happiest conference of the big three. Everything went well. They agreed. They had to hammer out hard, what are we going to do about Poland, which was the big question, right? Because Poland's a big country right there on the Soviet border. And Britain had entered the war provoked by Hitler's invasion of Poland. By the way, Soviet Union also invaded Poland at that time in alliance with Hitler. So Churchill's trying to save Poland, and Roosevelt is too. And they work out language that they can all agree to. And basically the language says that the Polish government, wartime government in Lublin in Poland, which is under Stalin's thumb, will be the basis of the government. But it will be expanded to represent all groups, and that meant the London Poles especially, the ones who'd been leading Poland and fled when Hitler took the country. And so that way we'll have democratic elections. And this language was carefully hammered out. And then it was completely and utterly ignored. There's an episode-- I just read it last night-- where the Lublin Polish government invites a bunch of Polish leaders on a urgent call to come to Poland and confer because we're getting close here and we need you here now. And they go, and they're put into some cars, and they're never heard from again. And so things like that started happening right away. And all of this stuff, by the way, is extensively documented, right? That means that, of course, Churchill and Roosevelt, they correspond a lot about this. And they end up drafting up several letters, where, at the same time, they will send Stalin similar letters, and those are coordinated, right? And then the letters go, and then they get back a short letter from Stalin that basically says-- there are various kinds of them. But they are all alike in that they denied that the facts are like they say. They say, this man that you're protesting about was an agitator, and he set up a sabotage radio station and dah-dah-dah-dah-dah. And of course, we have to protect our troops. And so the coordination between Roosevelt and Churchill takes days. And then they don't write-- neither one of them writes to Stalin without talking to the other one, got to stay in lockstep. And like this Moscow meeting in October 1944, where Churchill went alone, that's kind of an exception to that. HUGH HEWITT: And what prompted that? What prompted that? LARRY ARNN: Well, Churchill could see that the end of the war could be the establishment as the prime European power, the Soviet Union. And so we'd be-- the whole war would be a process of robbing Peter to pay Paul. And so he just saw that coming. And he wanted to get-- if you could picture a map of Europe in your mind, it's surrounded on three sides by seas, right, by the Mediterranean and the Atlantic and the North Sea and in the far north, the Baltic. And so the Allied attack to retake Western Europe really involved all of those seas eventually. And Churchill wanted the southern way to prosper, because you could get all the way into the Black Sea, if you could take the right amount of land. LARRY ARNN: And the Americans thought that the shortest distance to Berlin is a straight line from Washington, DC. It's even unfortunate that we have to stop off in London to mass up our troops, right? And Churchill was thinking of a grand envelopment of Europe. And of course, George Marshall and Roosevelt said, Churchill is just re-fighting the Dardanelles campaign from the First World War, trying to get his vengeance. And he never does surrender an idea. And he wasn't trying to get his vengeance, I don't think. But I think he was very reluctant to surrender an idea as grand as that one. He wanted-- he expected-- if he got what he wanted in the war, what he said he wanted, I mean, what he would want, if he could get it, is the extirpation of communism. The Red Army was the overwhelmingly largest army. HUGH HEWITT: Yeah, that was not happening. LARRY ARNN: So you're not going to get that, right? So what he wanted was a string of buffer states that would be real buffers, right? And that means Estonia, Latvia, Lithuania, Poland, Bulgaria, Romania. HUGH HEWITT: And it worked. LARRY ARNN: And they would have free governments, and they would be in alliance with the free governments of the world. And those free governments would help to maintain, on behalf of the Soviet Union, that they would be friendly to the Soviet Union and not do anything counter to its interests. HUGH HEWITT: And over the period of 50 years, it worked. When we come back, the final segment of Churchill and summitry, as Donald Trump prepares to head to North Korea. Welcome back, America. It's Hugh Hewitt joined by Dr. Larry Arnn, as we talk about summitry on the day after the announcement that stuns many people. Donald Trump is going to sit down with Kim Jong-un. I think it's to do a reverse Munich. Not peace in our time, but my highway or no highway. LARRY ARNN: War in our time. HUGH HEWITT: Yeah, war in our time. Do you think I'm right about that, Larry Arnn? LARRY ARNN: Well, I think it's, in some ways, foolish to compare anybody to Winston Churchill. But Donald Trump has this in common with Winston Churchill. He has a high belief in his abilities. And he thinks he goes talk to that guy. And I think he'll, if he does what he does in public, I think that he'll show the fist. And he'll put the velvet glove on it. And he'll offer him the moon. Or he'll offer him-- this kind of rhymes-- the tomb. HUGH HEWITT: Oh, that is, the moon or the tomb. There you go. LARRY ARNN: Anyway, I think that's what it's like, right? If you read-- they're very detailed records of these summits, all of the summits, where there are two or three gathered together, there are detailed records of the conversations. Of course, the dinner conversations, not so detailed. They're good. But they're very important, right? And there are always passages in them where they refer to their power to do things that will hurt the other ones if they don't get their way. They never state them as a threat. If you do that, I will this. You say things like, our army is there in that place. And we have to take care of it and not have its flank threatened. And they're just-- Stalin says things like that a lot. And that means he's reminding everybody, we've got 20 million people and more tanks than you've got and more planes than you've got and more trucks than you've got, including your trucks that you sent us. And so we're there, right? And that's a threat put in a very gentle way underneath a shell of civility. And so those things happen. They're very valuable when they happen, right? Because you can get-- these things are complex. And as I've just been explaining, the summits don't all work out in World War II. Churchill thought that World War II ended tragically because it gave way to the Cold War and, of course, another respect, the incredible cost to his country. And he knew that the first thing he feared, the Cold War part. And the Cold War came out OK, God bless Ronald Reagan and Edwin Meese, III. But think of the cost of the Cold War. Think of the hundreds of millions of people who died in the Cold War in those despotic countries and the costs of everything we had to build to fight it, to prevent it becoming a hot war. Well, Churchill thought that was a tragedy. And that came because of the foolishness, he thought, of the free countries not to be ready. So as regards North Korea, the most important thing going on in the world right now is going on in the United States defense budget, because we're either going to be in a position to harm those people in ways that they would fear. Or else they are going to be aggressive, and they're going to continue to circle us in and exclude us from Asia and threaten us harm. And so Trump needs all of that, right? He needs weapons. He needs tools. These people rule by force. They don't rule the way he rules. He had to get elected. And he has to go out on the road all the time and talk to the people of Pennsylvania and Ohio and Michigan and try to persuade them to vote for him, right? These guys he's going to talk to, they're not like that. If they think of ruling somebody, they think of a stick. And so he's got to remember he's in that world. HUGH HEWITT: And just a question of place, and we have a minute here, Yalta, Potsdam, they were not famous places. Nor was Reykjavik until Reagan walked out on Gorbachev. Where do you think they ought to do this, if it comes to pass? HUGH HEWITT: You know what? They're listening right now. And someone's going to walk into the boss and say, we got an idea. Kim Jung-un comes to Mar-a-Lago. Gonna love the place. LARRY ARNN: I think it's great. Because he had Xi there, the budding tyrant of China, right? And didn't leave during dessert and bomb Syria and come back and say to him, I just bombed Syria. How's the cake? I don't know where you go. So give that some thought. Dr. Larry Arnn, always a pleasure. Talk to you again next week. Hey, America, go to hillsdale.edu for the Churchill course. Celebrate Gary Oldman's Oscar win by watching the man who is the official biographer on the project forever, Dr. Larry Arnn, as they put out the documents. You want to learn about Churchill? Go watch Dr. Larry Arnn lecture about Churchill.